The Texas men’s tennis team swept Miami 4-0 Saturday at the ITA Kickoff Weekend at the Texas Tennis Center. The win advances the Longhorns to the ITA National Indoor Championship in Chicago, beginning Feb. 15. Texas won the doubles point after splitting two matches with the Hurricanes. They followed with three singles wins to clinch the victory and moved the Longhorns to 4-0 in dual-match play. Yuya Ito and Chih Chi Huang won 7-6 (5) in a tie breaker to clinch the doubles point. Christian Sigsgaard and Harrison Scott took the other Longhorns’ win earlier, 6-0. 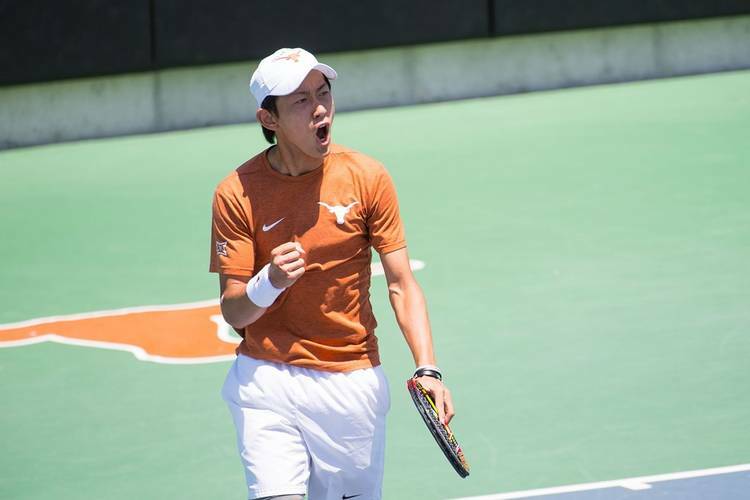 Ito won 6-1, 6-1 over Bojan Jankulovski to make it 2-0 for Texas. Sigsgaard bested Soriano Barrera this time, defeating him 6-3, 6-3. Huang clinched the match with a 6-2, 6-3 win over Franco Aubone. The Texas men’s tennis team next faces UT-San Antonio Wednesday at 2 p.m. Later that day they take on Texas A&M-Corpus Christi at 6 p.m. Both matches will take place at the Texas Tennis Center.